I've recently been collecting game cartridges for my old Sega SC-3000. 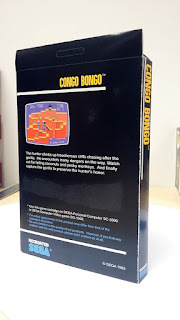 This is a home computer that is literally the same hardware sound in Sega's first game console (the SG-1000) with a little more memory housed inside a keyboard. While I am not even sure if the machine still works (it needs a missing video daughter-board) I figured that old cartridges are not always that easy to come buy so I'll grab them when I see them. 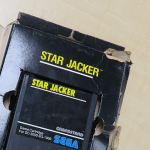 Unfortunately most second-hand cartridges for the Sega either have no boxes, or severely deteriorated ones that break apart and get crushed over time. 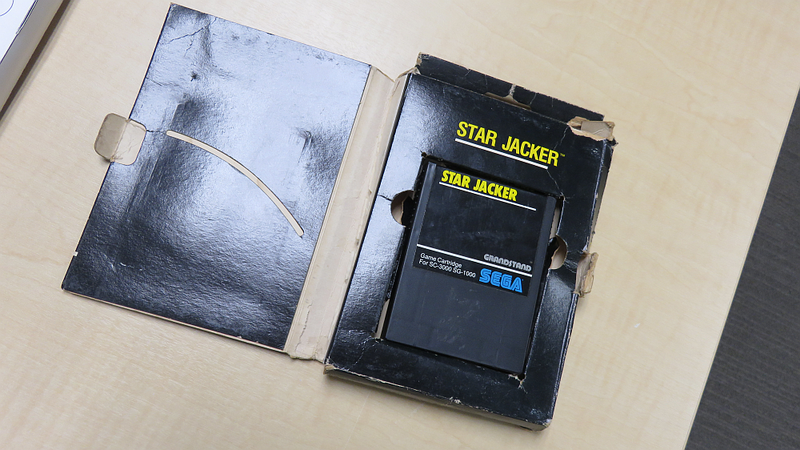 A typical example is seen below with Star Jacker. Its been crushed, and the cardboard has just ripped and worn away in places. Well loved, ripped and worn. 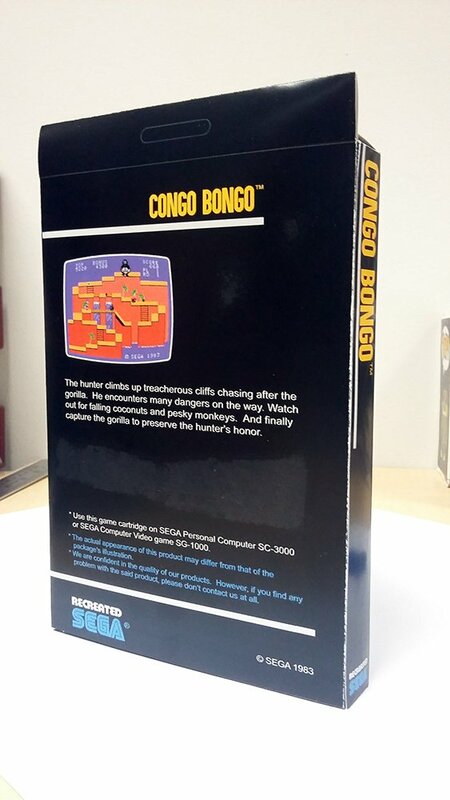 Because as a collector I love to clean things up and give them some some level of display-ability when seen on the shelf, like my Atari 2600 carts I wanted to look at recreating replacement boxes for these games that appear authentic and help make my collection look more complete and tidy. 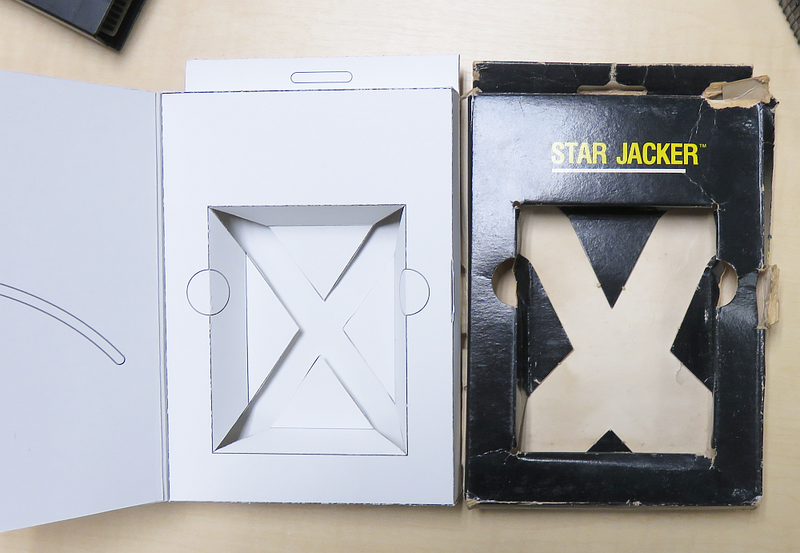 The main star of this project of course is the physical form of the box. 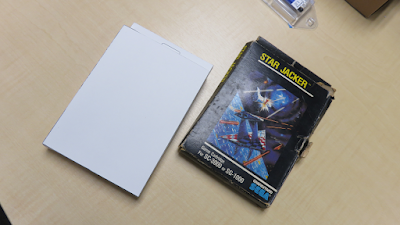 I started out measuring up the dimensions of the box from Star Jacker. It was very easy to measure - mostly helped by the fact it was damaged and therefore easier to fold out without 'breaking' what is already broken. 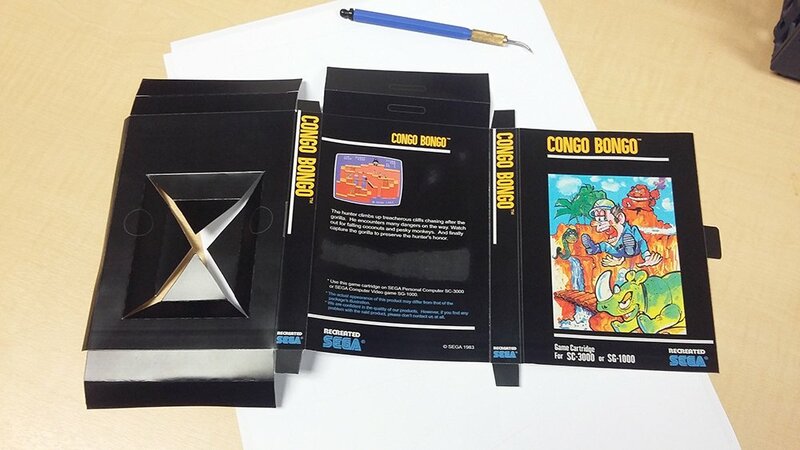 Once I had the measurements, I fired up Illustrator and laid out the box. Problem with this box is if laid out as a single fold-able piece that it exceeds the length of an A3 sheet, so I broke up the box into two pieces - the inner box, and the front flap itself. This would need to be printed on two A3 sheets separately and then glued back together. Template done, I printed a test using 300 gsm recycled card. Cut, scored and and glued it together. It pretty much worked first time! I found I needed to make a few minor tweaks to complete and finish it here and there properly, but hey, pretty spot-on! 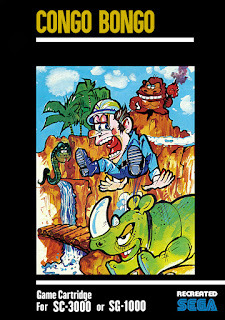 Otherwise, read on and I'll walk through some of the steps I took to remake some artwork for this template. Restoring the actual artwork from the high res scans was relatively painless. The images were fairly clean though most of them had a half-tone screen pattern (fairly common when scanning). Luckily removing this with Photoshop is relatively simple. In this case, a little Gaussian blur was applied until we can say 'bye-bye' to the screen pattern. 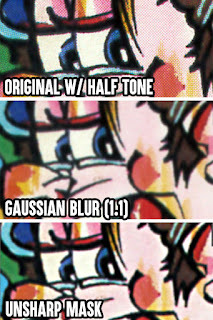 Photoshop's Unsharp Mask then takes care of popping the sharpness back on. If artwork has scratches, folds or damage then some repair with the usual stamp/heal brush tools or other general tools is usually fairly straightforward. With the artwork and logo out of the way, the only thing left was all that text. 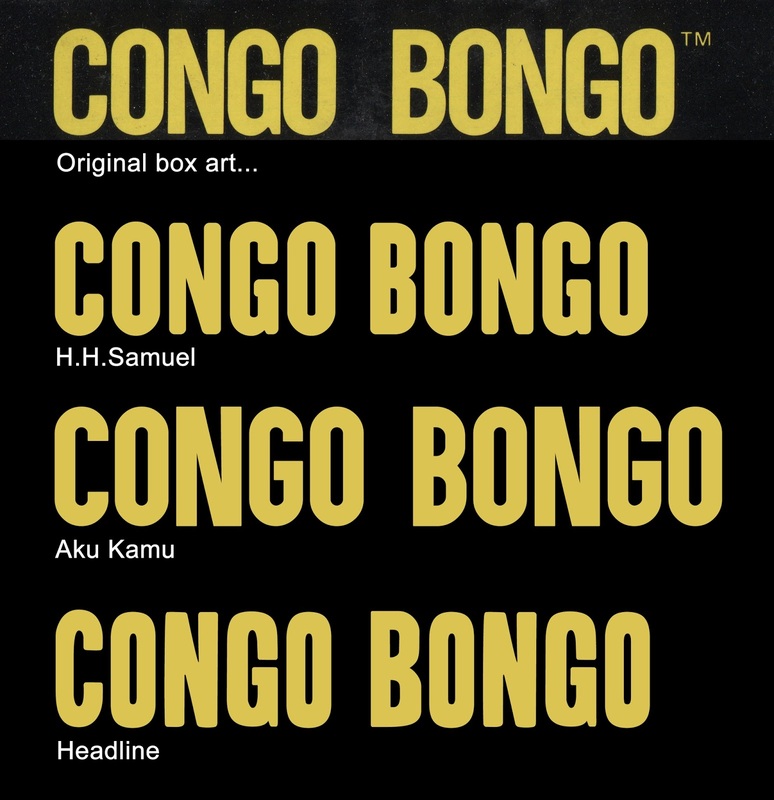 The title text itself is written using a condensed San-serif font. There were a few installed on my PC, and I did manage to identify a font or two using Photoshop's Match Font tool (the one closest was "Haettenschweiler" (a free font)). For those who do not have this particular font, or would rather find an alternate, I paid a visit to dafont. I found a few similar free options that also fit the bill. 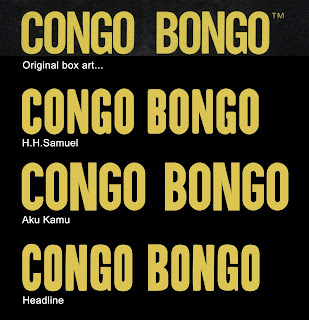 None of these fonts are a perfect match unfortunately, however a very close runner for the titles is Aku Kamu as we can see when compared to the original title. But enough font-talk... This isn't a graphic design blog - its a nerd blog! 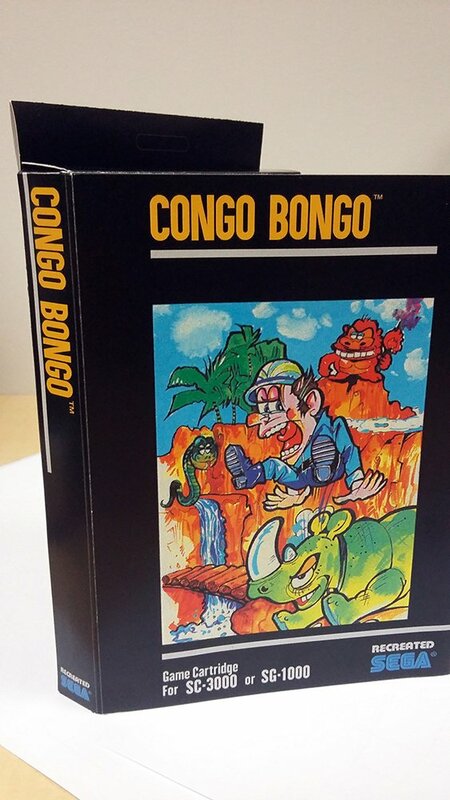 With this in place, a slightly cleaned up image recreated a Congo Bongo box cover that looked like this. I drew in the white lines using one of the scanned images as a placement reference. I ended up using Aku Kamu for the title, h.h.samuel for the lower text. I decided that the Grandstand branding that appeared on the original over the top of the SEGA logo would be replaced with the word RECREATED instead using a free font called Barbender Bold. There may be a slightly better font online but this was pretty close for what I needed. 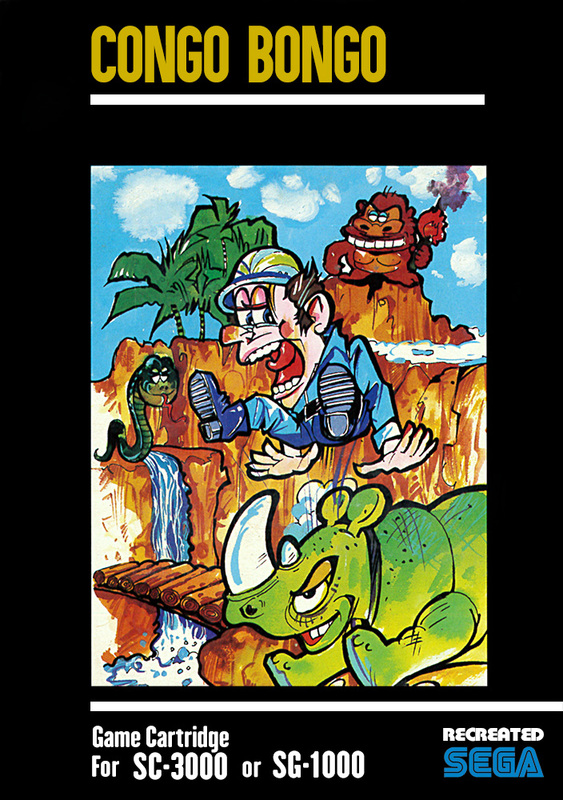 Arcade action - the back of the box. 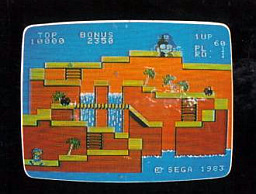 Most game boxes featured a screenshot from the game on the back. Rather than restore the image itself (not the easiest of tasks), I opted to find an emulator or game play video and just grab a frame from the game screen to get a crisp new screenshot. Obviously to make it more authentic, the original had a slight lens distortion to it, but that is relatively simple to do using distortion tools found in most image editors these days. The same can be said of a nice white frame around the edges. As mentioned, this should be print on two A3 sheets - and of course ensure you do not scale or 'fit' this to the page as the dimensions are correct. I originally used 300gsm card which gave me the result I was after. For the color test, I used 210gsm gloss as you can see below. Its fine, but I think something between 250-300 would be a better weight. I would have loved to have this as one single cut-out rather than two sheets, but that would require large paper sizes (likely A2) but that would require a large printer and would be a huge waste of paper for just a single box at a time (probably fine if you want 2-3 on one sheet). Put it together and it's not too shabby. Sure, I need a little more tweaking here and there, but for a first attempt I've pretty happy. While black is authentic, I am tempted to stylize it to white to save on printing and to make things less noticeable with finger prints... You can see on the back of the test box there is a weird smudge in the black below the description text - but that's an experiment for another day. If your SG1000 or SC3000 collection is in need of packaging and you don't mind doing a little DIY graphic design, please do download the templates and have some fun. Note that this template is based on the New Zealand retail boxes (with hanger hole) but feel free to edit and modify as needed to match your needs!